Cape Town is a beautiful city with a lot to offer visitors. It has beautiful landscape, fascinating culture, and many different adventure sports. It's nightlife is also popular with young travelers and backpackers who are looking to have a good time. 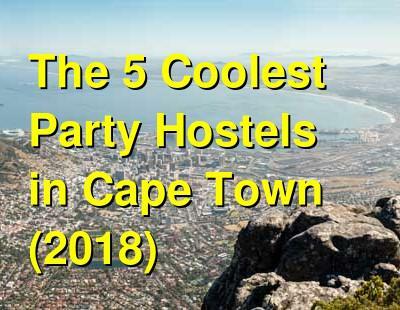 These hostels are a great place to start if you're looking for the best nightlife that Cape Town has to offer. How much do hostels in Cape Town cost? Long Street Backpackers was established in 1993, and was the first hostel on Long Street. Ever since then they have offered a sociable and fun atmosphere to all guests. They even offer a free vegetable potjie (traditional stew) every Sunday evening. The facility has a large, self-service kitchen, poolroom, bar, TV room with satellite TV, and two big balconies to relax and enjoy the surroundings. The dorms range from two beds to a maximum of 10 beds. They also have single, double, or twin rooms. The staff can help arrange all day tours, garden route tours, adventure tours, safari's, overland trips, car rental, Baz Bus tickets and much more at the on site travel desk. Long Street is known as party central for people passing through, its ideal for single travelers wanting to make friends. Experience the wine, waves, and nightlife in the midst of all the activity in center city Cape Town. The energetic and social atmosphere Long Street Backpackers promotes will help to fulfill your Cape Town expectations. Long Street Backpackers is at the heart of Cape Town's nightlife with 24h surveillance. Situated on the vibrant Green Point strip, the hostel is surrounded by modern restaurants and bars, only a short 5-minute stroll to the famous V & A Waterfront overlook the Cape Town Stadium, and in walking distance of Cape Town CBD and Seapoint Promenade. Easy access to public transport provides guests with rapid access to Long Street (South Africa's most popular party destination), Table Mountain and some of the best beaches Cape Town has to offer. The hostel provides a range of accommodation including shared dormitories and double/twin rooms. Separate sanctuary accommodation is also available for females only. The majority of rooms are en-suite with additional communal bathrooms provided for extra convenience. Basics, necessities like lockers, bedding, heating, and air conditioning are supplied in all rooms. Additional property facilities include a communal kitchen, free fiber speed Wi-Fi throughout the building, and an internet zone. All rooms and bathrooms are cleaned daily and beds are made with fresh linen daily. Reception is staffed 24 hours per day and a security card is used to enter the hostel and to access all rooms. All dorms are fitted with their own lockable luggage locker and you may purchase a padlock from reception. The onsite Randy Warthog, Bar and Restaurant overlooks the property swimming pool and sundeck and serves mouth-watering inexpensive meals. The Randy hosts parties and events most days of the week to keep you entertained. From beer pong to board games, there is plenty of fun to be had and prizes up for grabs. They also have an in-house travel desk offering a wide variety of tours and adventures, ranging from laid back wine tours to skydiving for the more adventurous types. No person under 18 is allowed to stay. Secure parking available at an extra cost. Free city maps, Wi-Fi, linen, and breakfast are included. 33 South is a Boutique Backpackers - not only because of the individually themed rooms, fine linen, and safe per person, but also, because the staff are there 24 hours a day to help you with questions, queries, and tips. The hostel is located in the observatory, the student neighborhood of Cape Town. It is characterized by cheap beer and good food topped off with an array of artists and musicians that leave you begging for more. At the reception you'll not only find a selection of tours, activities and great music, but also insider-info on the best restaurants, surf spots, music festivals and loads of 'off-the-beaten-track' adventures. The 'Stoked School of Surf' is now operating from 33 South - beginners to advanced will find their surfing legs with the onsite surfing coach. Free city maps, Wi-Fi, linen, parking, and breakfast are included. Carnival Court has the reputation of being one of the best party hostels in Cape Town, and it's a well earned reputation. It's located on the trendy Long Street, where you'll find many other hostels. It's set in a Victorian building and is close to many of the popular bars, clubs and restaurants. The building has two large balconies where you can hang out and watch the street life. The bar starts to fill up in the late afternoon. It's a great place to meet fellow travelers and grab a drink or enjoy a game of pool. As the night progresses you can head out to any of the countless bars and clubs that are nearby. There's a barbecue every Sunday that has three salads and garlic bread. Just show up with some meat and you can enjoy a true South African braai. This is probably THE place to stay if you're looking for a party in Cape Town. Make reservations early because it does fill up. If you stay here you'll be just a short hop from the city's best bars and clubs. The hostel itself has a lot to offer guests including a bar, BBQ, and garden where you can relax, a TV lounge, and private rooms. The staff is friendly and informative so don't hesitate to ask if you have any questions. The guests are typically social and out to have a good time, so if you're looking for someone to head out on the town with, then this is a great place to stay. Whether you're traveling alone or with friends, you'll easily meet new people staying at this hostel. Their tour desk can help with tours, car rentals, and other services around town and for the rest of South Africa. Free internet/WiFi, and breakfast is included, too!